The Comforter PR-501L-26D is a dual-motor version of Golden's best selling and best all-around performing large-sized lift chair. 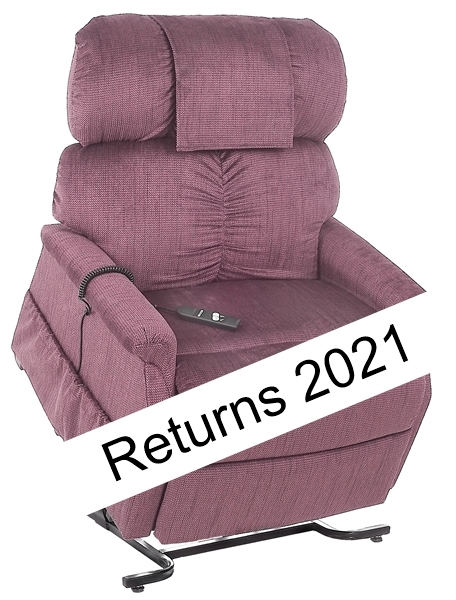 It combines a tried and true three-position lift mechanism with a 500-pound weight capacity, ultra-plush seat and back pillows, a reinforced hardwood frame, and a removable back. Every Comforter also comes with a 7-year pro-rated warranty and can be ordered with premium Ultra Fabrics. Seat to Top of Arm: 5.5"
Floor to Back Edge of Seat Raised: 29"
Floor to Front Edge of Seat Raised: 25"